Product prices and availability are accurate as of 2019-04-19 10:26:47 UTC and are subject to change. Any price and availability information displayed on http://www.amazon.com/ at the time of purchase will apply to the purchase of this product. The flexible toddler baby banana brush was created by a mom hygienist and is the ideal toothbrush for toddlers ready to graduate to their first real toothbrush. 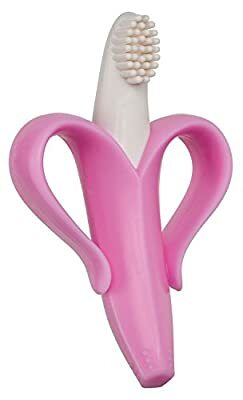 This the fun banana shape and soft silicone make brushing a fun experience and promote good oral hygiene habits at a young age. It is made of the highest quality grade silicone and is compliant with the strictest government standards. The unique flexibility is much safer than traditional toothbrushes and decreases risk of mouth injury. The unique c shape curve allows for easy access for difficult to reach back teeth. The baby banana brush is dishwasher and freezer safe. Parental supervision recommended.